A classic recipe I conjured a few years ago, living in Northern New Mexico. 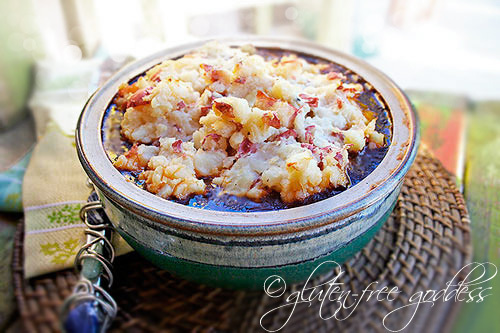 From the archives: I have been craving comfort food and shepherd’s pie- even though it’s been a warm and breezy week here by the Chama River north of Santa Fe. The promise of Spring is tugging at our sluggish winter bodies, cracking and stiff and a tad thicker than one would care to admit. We are itchy to walk- just as the junipers are shedding pollen in curtains of dirty yellow. We walked and sneezed and rubbed gritty eyes. The coyotes are laughing on the rim of the mesa. I listen and note they are closer than usual, emboldened by our wintery hibernation. The land belongs to them now. We’re simply tourists. As it should be, I murmur. Meeting your soul mate (did I just write the words soul mate?) after mid-life will humble you. An autumn meeting of kindred spirits inspires a sharp thirst for more time. More juice. Looking ahead- down the road of your life- can be alarming. It’s shorter and rutted and slightly curving downhill, not so far and away anymore. Carpe diem as the wise ones say. And though (in theory) we should all embrace each day as if it might, indeed, be our last, this effort gains a deeper poignancy at 54. My knuckles are so bumpy with arthritis now I can no longer wear my wedding ring. I twisted it off with pain and dish soap. I didn’t want to have it sawed off. Just the thought of the saw buzz made me shiver with separation anxiety. When I was lying on the gurney outside the operating room, awaiting hip surgery– after ten hours in the ER playing our Movie Game with said soul mate (to play the game you start with A and take turns naming a movie title until you run out of A’s; then you move on to the B’s) the pony-tailed anesthesiologist told me to remove my wedding ring. I can’t, I said. It won’t come off, don’t worry. It’s hospital policy, she explained. To remove jewelry before surgery. You’ll need a saw, I said. She smiled. I’ll get some surgical tape- we’ll tape it, she whispered. I tilted my face toward my husband. He stood there, stoic and brave, betrayed by a gleam of wetness obscuring his usual clear and steady blue gaze. We both knew the risks of breaking a hip, and undergoing emergency hip surgery. The odds aren’t kind. But my age was in my favor. I was twenty years younger than the average woman who falls and breaks a hip. You’re a spring chicken, the surgeon had said. I love you, I told my husband. Tell the boys I love them. I felt the nurse tape my wedding ring. Ready? she asked. Yup. Carpe diem, I answered. Hibachi Stir-fried Chicken + Veggies for a DELICIOUS Budget Friendly Meal!